Want to find out how you can leverage the new features in your classroom? Request a 1-on-1 consult with us today! Classroom set up getting you down? 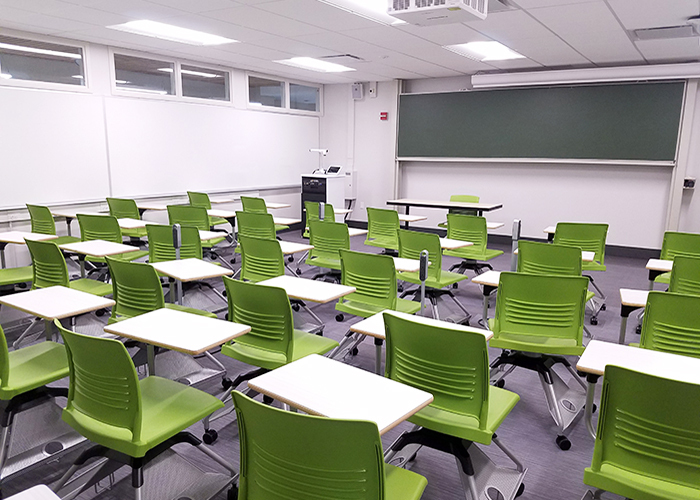 If you aren’t teaching in one of these renovated rooms, but you want to consider how to make your classroom work for engaging students actively, please get in touch with us. We can help! Many of the renovated classrooms feature single, moveable student desks. Not only can they be arranged in the classroom with greater ease, but the desk itself can rotate to accommodate left- and right-handed note-taking. This upgrade is a great improvement over former, fixed seats that were hard to maneuver and had little table space. Instead of the “sage on the stage” model, instructors can now more easily incorporate interactivity in any class period, whether pausing for students to confer on a question, or allowing groups of multiple sizes to form and work through problems or discuss features from assigned readings. With the versatile furniture, the classroom arrangement can reflect new modes of learning: flexible and multi-directional (among students and instructor), rather than fixed and unidirectional (only instructor to student). Instead of lecturing for the whole 50-minute class period, an economics instructor decides to incorporate 5-minute mini case study breaks after each of the main topics for that class period. After finishing a topic, he asks students to move into small groups to work through a concrete application problem projected on the screen. The students quickly put their desks together, giving them both ample space and opportunity to collaborate freely on the scenario at hand for 3 minutes. The instructor then takes 2 minutes to have a few groups share their responses and to highlight the main principles illustrated by that example. The upgraded classrooms also have new and improved audio-visual systems. 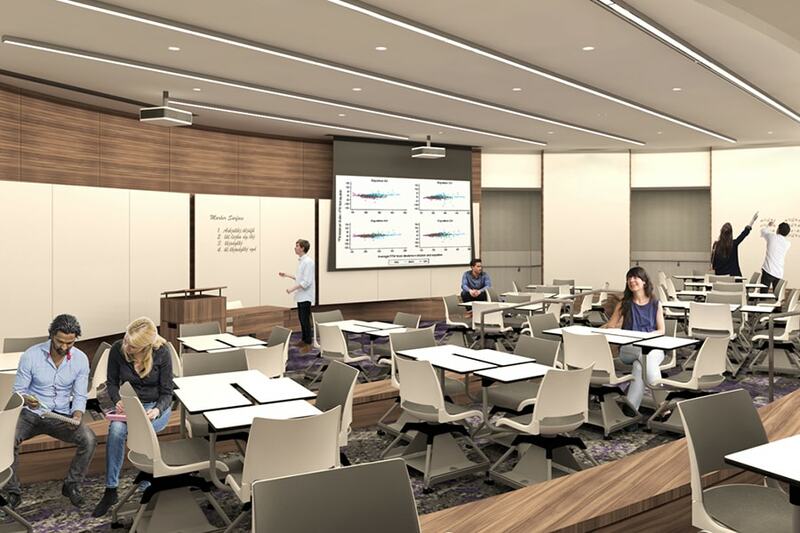 This includes expanded whiteboards, new AV equipment (including enhanced touch panels and document cameras), and larger projection screens. One pedagogical advantage to these improvements is the ability for students to share their work more easily. The whiteboards promote collaboration, while the DocCam allows students to quickly take turns sharing their work done on paper with the entire class. In addition to increasing student engagement through sharing and collaboration, these AV systems provide opportunities for frequent practice and feedback during class sessions, which is critical to the learning process. An instructor leading a physics recitation section of about 25 wants to give students the opportunity to learn from each other’s work, as well as address common errors. Every class she chooses three students to share their homework either singly on the DocCam or concurrently on one of the many whiteboards. The class divides into three groups, each with one of the students leading, and they talk through the problem and that sample work. The instructor gives them specific questions to answer (What are the main principles underlying this problem? What parts did you struggle with? Are there any places where the student’s work could be improved? How would you represent this solution graphically? ), allowing both the leading student and collaborators to identify the difficult and most salient parts of the problem and associated concepts. This approach also ensures that students regularly receive in-depth and productive feedback while practicing their communication skills. For more ideas on how to take advantage of your new classroom, set up a 1-on-1 consult with us! Freeman, S.; Eddy, S.L. ; McDonough, M.; Smith, M.K. ; Okoroafor, N.; Jordt, H.; Wenderoth, M.P. (2014). Active Learning Increases Student Performance in Science, Engineering, and Mathematics. PNAS. 111(23), 8410-8415.